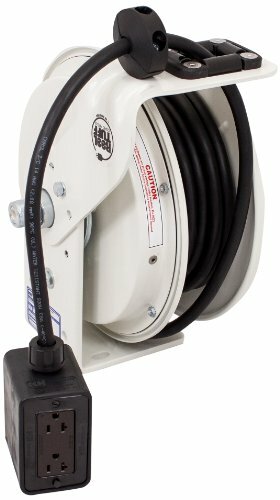 KH Industries ReelTuff white retractable cord reel is industrial grade with a slip ring rated for 30A at 600 VAC. Includes 25 feet of 12 AWG 3 conductor Black SJOW cable, cable and is rated for 20 Amp at 300VAC. Comes with 4 foot power feeder cable with NEMA 5-20P for easy onsite installation, 25' SJOW retractable payout cable has a prewired ReelTuff outlet box with four NEMA 5-15 receptacles (two duplexes). Features a heavy duty formed steel mounting base with safety chain hole for ceiling, wall or floor installation. Adjustable cable guide, ball stop and ratchet. Ratchet can be engaged (positive lock) or disengaged (constant tension) as needed. Made in the USA. Cord Reels are derated to NEMA 2 when accessories are added. If you have any questions about this product by KH Industries, contact us by completing and submitting the form below. If you are looking for a specif part number, please include it with your message.